"My heroines are true to life – just look around you at Japanese women. They are strong, and they outlive men," director Shôhei Imamura once observed. And so an audacious, anthropological approach to filmmaking came into full maturity with the director's vast 1963 chronicle of pre- and post-war Japan, The Insect Woman (Nippon-konchûki, or An Account of Japanese Insects). Comparing his heroine, Tome Matsuki (played by Sachiko Hidari, who won the Best Actress award at the 1964 Berlin Film Festival for the role) to the restlessness and survival instincts of worker insects, the film is an unsparing study of working-class female life. Beginning with Tome's birth in 1918, it follows her through five decades of social change, several improvised careers, and male-inflicted cruelty. 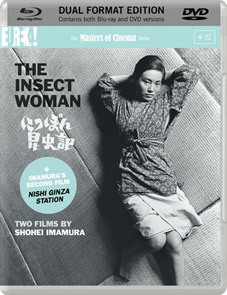 Widely recognised as one of the most important films of the Japanese New Wave of the 1960s, The Insect Woman will be released in the UK together with Imamura's rarely seen 1958 feature Nishi-Ginza Station as a special Dual Format edition by Masters of Cinema on 20th February 2012 at the RRP of £25.52.